When I reviewed Free MP3 Cutter , I gave it two thumbs up; however, two dotTechies unstintingly suggested mp3DirectCut  as a better alternative. mp3DirectCut was supposed to evolve since that time, but does it live up to my expectations as of today? It’s time to find out! 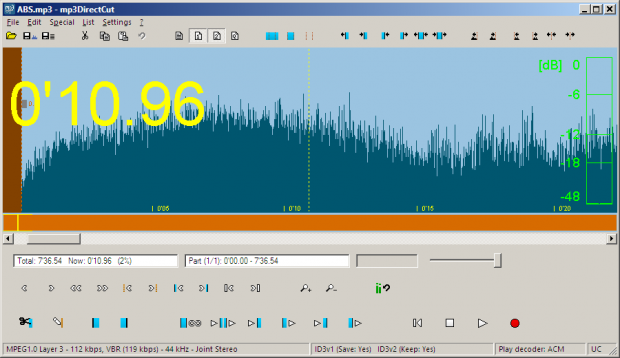 mp3DirectCut is a free fast and extensive audio editor and recorder for encoded MP3. mp3DirectCut is a surprisingly small tool for editing (that includes but not limited to, cutting) MPEG audio directly. You can remove unnecessary parts, alter the volume, split files, or crop/copy regions to new files, all without the need to decompress your MP3 into PCM/WAV aka re-encoding/transcoding. This essentially saves work, encoding time and disk space. There is no quality loss to the edited files into the bargain, which is what an audio aficionado always appreciates. The built-in recorder creates MP3 on-the-fly. Using cue sheets, Auto Cue (Shift + Ctrl + A), Pause detection (Shift + Ctrl + P), or Auto crop (Shift + Ctrl + C), you can easily divide long files (say, audiobook). The interface may be a bit daunting for a beginner; however, if you hover the mouse pointer over any icon, the phrase that is displayed is pretty much self-explanatory. It’s not a music editing utility; so, forget about of adding tracks or fancy loops. Download the self-extracting EXE, and extract to a folder of your choice. If you want to run it from a removable USB device without installation (i.e., portable; stealth is yes), make sure to select ‘Portable forced’. Launch mp3DirectCut.exe. Optionally, delete the language files you don’t want. The ‘flat’ design with similar monochrome icons may feel like a step back in usability. Apart from grouping of toolbar buttons, the appearance can be customized by going to Settings > Configure (F11) and selecting the Layout tab. Direct stream copy is something that a connoisseur media editor looks for in the first place. Since MP3 is already a lossy format, you won’t like further loss of information, and this is where mp3DirectCut excels. Moreover, this astoundingly tiny application offers additional tinkering that adds value to a professional audio editor. Naturally, it has exceeded my expectations. mp3DirectCut is probably the best free MP3 ringtone maker for your phone from your MP3 of choice. An audio editor buff or not, try this if you have not yet done so unless you want a whole bunch of bells and whistles. Like it or not, let us know in the comments!